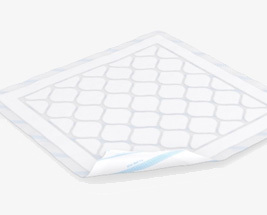 Designed to a high level of quality, all of our disposable bed pads contain virgin fluff pulp and have a polyethylene blue backing for extra protection. The pulp has been designed with a diamond-shaped wicking to maximise absorbency by spreading the absorption across the pad. Please use the navigation tool on the left to direct you to disposable bed pads that meet your exact requirements.